This book is the reference guide to creating skin tone colours for your portrait drawings. 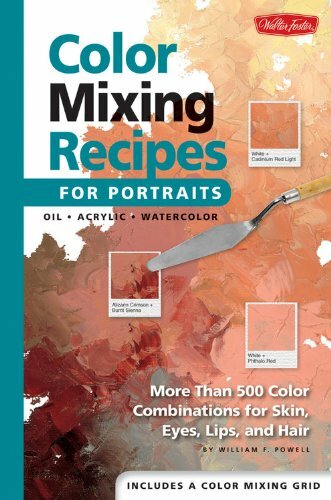 The color mixing recipes covers oil and acrylic mainly, with only 6 pages dedicated to watercolour. The book has only 48 pages. Color recipes are presented in table format, with different colours going across and down, and the resulting mixture. The amount of paint used is also mentioned. There's a bit of learning curve because it will take a bit of time and effort to understand how to read the proportion of paint to be use. It will certainly take more time if you're to experiment with all the recipes shown. In general, I think it's a good starting guide for oil and acrylic beginners as they are presented with the most commonly used paints for portraits. There are many paints listed so I don't suppose you'll have all of them, but you should have no problem finding substitutes for experimenting, especially after you get the gist of the pattern shown by the recipes.